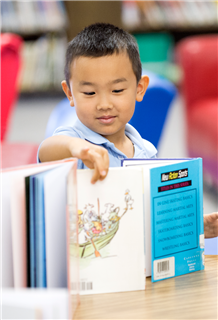 The Lower School Library provides access to a variety of information sources, services, and materials to support the curriculum goals and objectives of TCA and meet the unique needs of students for independent study and personal reading. It is designed to accommodate students from preK through fourth-grade in an inviting and comfortable environment. A spacious story loft provides three carpeted tiers for classes or individual reading. A warm and inviting reading area is provided to encourage quiet reading for the students. Accelerated Reader is highlighted in the library as well. Monday – Thursday: 7:50 a.m. – 3:40 p.m.
Friday: 7:50 a.m. – 1:30 p.m.